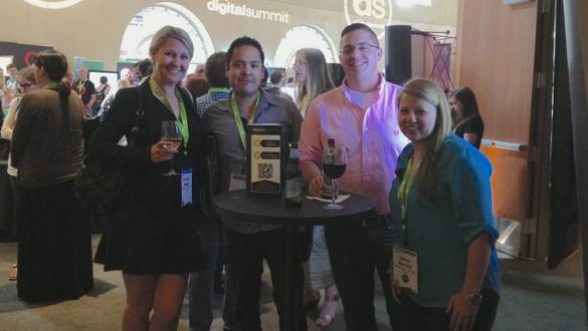 MS Marketing and MBA students at the CU Denver Business School attended Digital Summit Denver as part of a new course offered this summer, “Hot Topics in Digital Marketing”. The course is delivered in an innovative hybrid format. One of the 1st to include a conference, it combined the intensive Digital Summit Denver experience with additional on-line discussion and assignments. To complete the course, students also create a digital marketing campaign for a local organization. The highlight of the course, Digital Summit Denver, took place on June 15th and 16th in Downtown Denver at the Performing Arts Center. It offered an intensive pre-conference workshop, an expo, industry-famous keynotes, and over 60 other speakers who presented leading-edge techniques. The conference also featured many networking opportunities to learn more about careers in digital marketing. Digital Summit Denver created a “real-world” environment to immerse students into the culture of the digital marketing world. Students learned about companies leading the industry, the latest trends, and best practices. This unique course has not only increased educational knowledge of digital marketing, but has also given students a new perspective about the industry and its leaders. This course is part of a new Specialization in the Master of Science in Marketing program offered in the heart of downtown Denver at the CU Denver Business School. The Specialization, Brand Communication in the Digital Era, provides a scientific foundation along with experiential learning to prepare graduates for fulfilling careers in marketing management. The program includes many opportunities for students to interact with business leaders via projects, guest speakers, events, and apprenticeships. Want to learn more about Brand Communication in the Digital Era? Contact Vicki.lane@ucdenver.edu. Find out more about Digital Summit Denver at http://digitalsummitdenver.com/about/.